Legionella becomes dangerous when it grows in purpose-built systems - such as cooling towers, potable water systems in hospitals, homes, fountains, spa pools, misting devices, etc. - where water is maintained at a temperature of 20° to 50° Celsius (68° to 122° Fahrenheit). Such water systems encourage the growth of biofilms creating expanded surfaces for Legionella to multiply. Biofilms consist of other bacteria, algae or amoeba and their secretions that can protect Legionella. In order to understand why Legionella bacteria is so dangerous and how it can infect the human lungs, it is crucial to first understand the lifecycle of the bacteria. Legionella pneumophila has two distinct phases to its life cycle: the replicative phase where it multiplies and the motile, dispersal phase, where it is looking for a new host and moving freely in the water system.1 This phase is sometimes referred to as Viable but Non-culturable (VBNC). In the motile phase, Legionella develops a shorter, thicker body with a flagellum and takes on a lower respiratory life form. In the motile phase, Legionella is at its most virulent and dangerous. 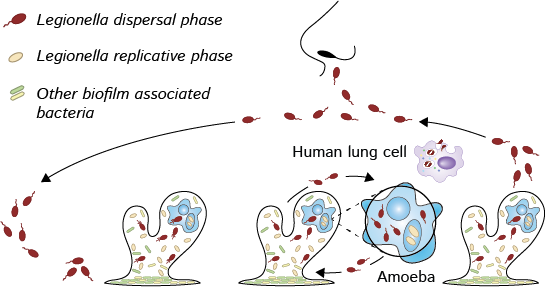 Once free of the biofilm and in the general water system, Legionella can be taken up by aerosol droplets - caused by any agitation of the water near a water/air interface, e.g. a showerhead or cooling tower. It is the motile phase of the Legionella bacterium which causes disease. 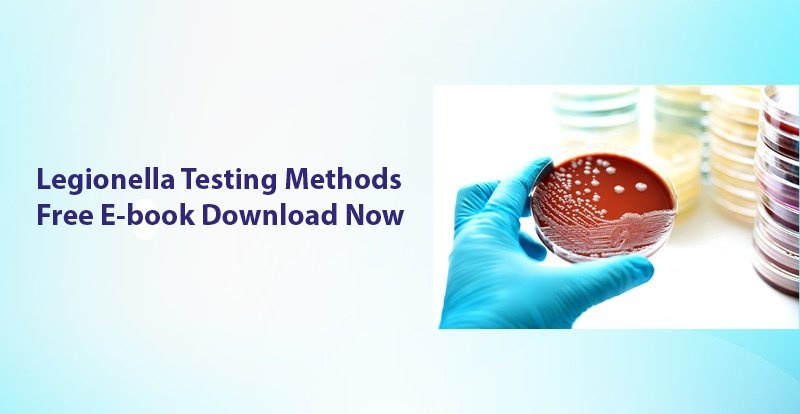 To sample the replicative phase of Legionella a biofilm sample, usually a swab test, is required. The replicative phase is very less likely to be sampled in the free water system. Why Lab Culture Test Cannot Protect You and Your Business From Legionnaires' disease? Legionella antigen and DNA can be detected in either phase and therefore methods of detection which detect Legionella antigen or DNA are better at detecting the bacterium when it is an immediate danger to humans. 2 Mena Abdel-Nour, Carla Duncan, Donald E. Low and Cyril Guyard: Biofilms: The Stronghold of Legionella pneumophila; Int. J. Mol. Sci. 2013, 14, 21660-21675; doi:10.3390/ijms141121660. 3. Mercante, J. And Winchell, M. (2015). Current and Emerging Legionella Diagnostics for Laboratory and Outbreak Investigations. [online]. Available at: https:// www.ncbi.nlm.nih.gov/pmc/articles/PMC4284297/ [Accessed 6 May 2018].